I don't want my America back, I want my America forward. I’m thinking of making myself unavailable. It worked for Madoff. Going to open an office smack in the middle of an inaccessible area. Hard to get to is easily as cool as hard to get. The more inaccessible I am, the more my prospects and peers will seek me. Not only will I turn down all work, but I’ll also turn down work for all my clients—if I deign to have any, because I think I’ll turn down clients as well. Then I’ll sit back and let everyone flock to me. Isn’t that what we all do—flock to those who are supposed to know more than we know? To listen for nuggets of wisdom. And the more they charge—or distantly and aloofly offer to discount—the more confident we are in the superior knowledge we think we are getting from them. Individuals and institutions begged Bernie Madoff to take money he couldn’t refuse. We humble ourselves at the altars of those who impress us with so little need for us. We place blind faith in remote sages, physicians and clergy, lawyers and psychoanalysts, who tell us what’s wrong with us in Latin. Our insurance, taxes and tithes don’t entitle us to a translation. We wait endless hours in doctors’ offices. Did you ever try to keep a doctor waiting? Try my prescription. Finally admitted to the inner sanctum of a specialist after an inordinate wait sans explanation or apology, I told him I intended to deduct what I estimated my time was worth from what his fee indicated his time was worth. I got his full attention. I don’t think I got the full benefit of his knowledge—but I left his office feeling better. In mind of that now, I’m having second thoughts about Distant and Aloof, Inc. I don’t think I can ever be one of the busy people I can’t get to. One of those busy people was Kenneth I. Starr—“I.” as in “incarcerated.” By playing as hard to get as his role model, the more-than-mini-Madoff money manager not so aloofly “distanced” more than $59 million from his starry clientele. This morning’s New York Times reports that Starr “asked to be released from jail on bail of $2 million” and “would be in the custody of his wife, Diane Passage.” Starr-Passage—what an inviting name for a company catering to the want-to-be richer and more famous! How cunning of the man not to use it. I clearly don’t have what it takes. I answered my phone half-a-dozen times today. I shmoozed with my doorman and stopped for acquaintances as I walked with my wife. So I’m folding Distant and Aloof, Inc. before it opens. Anyone have the number for The Wizard of Oz? This is not about Ringo. But as a postscript to a concert you leave on a high only to walk smack into a low, it rocks. 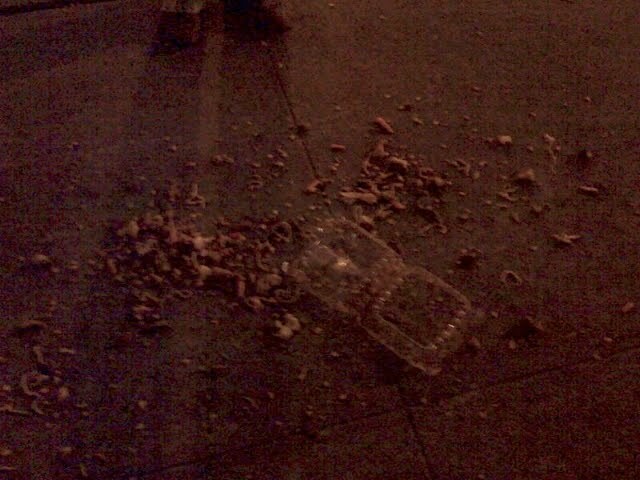 On impact, a clear, plastic-hinged “deli” food container flew out of the man’s arms, tumbled downward to land with a crunchy thud, opened and scattered its contents on the pavement. “Oh.., my food!” despaired the forlorn victim in the face of our identifiable surfeit. 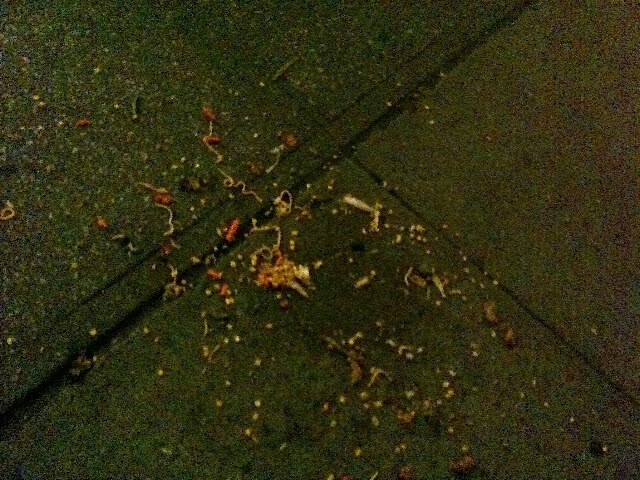 His small portion of food lay at our feet, its spicy aroma admonishing us for our clumsy lapse of urbanity. The moment went to Dottie’s heart. Dottie has been a New Yorker for two-and-a-half-years, i.e., not long enough to be a New Yorker. A young woman of eye-catching savoir flair, we have to take it on faith that she comes from McKees Rocks, PA, population 6, 018, just outside of Pittsburgh. She works as a hostess at "Alice's Tea Cup" while plotting eventually to open her own edgy coffee shop. Dottie’s heart went out to the poor man. Chagrined, she thrust her hand into her wallet and pulled a bill from it. His arm was outstretched before hers was. He took the bill, said thank you almost inaudibly, and departed. We asked how much she gave him. A twenty, she said. When asked why so much, she explained it was all she had. Guilt pays—someone else. 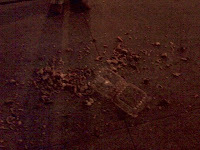 We walked about ten yards—and ran into a small pile of food. Ironically, it looked like and smelled like the first pile. Something smelled rotten. 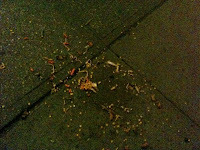 We walked another ten or fifteen yards and found, yep, another small pile of food. We started to backtrack, passing glimpsing “Peace and Love” concertgoers and inspecting tourists. Mound by mound, we confirmed that Dottie’d been had. At a loss at the moment to do anything else, we took pictures of the food with our cell phone cameras and went to dinner. As we recounted the hustle, a new one to us, over a good meal, the unfleeced three buying, Dottie described to us how she had seen the man coming toward her and tried to get out of his way, but couldn’t—he just kept coming at her. So much for “seemingly”—she wasn’t at all remiss, or careless, or oblivious. She was scammed! We were all taken in. And Dottie E. of McKees Rocks, PA, is $20 closer to being a New Yorker. Who in the world could be invited to Ringo Starr’s 70th birthday party brunch and miss it? My two daughters and I did. Ringo Starr began the celebration of his birthday, July 7th, at 10:45 with a private brunch party at the Hard Rock Café in Times Square. We three Foxes arrived as it ended, at 11:45. Anyone familiar with “Foxtime” won’t be surprised; we had the hour of the coveted invitation wrong. We had excellent tickets for the evening celebration at Radio City Music Hall, but I hadn’t intended on going downtown—a long Manhattan mile and a half—twice in one natal day. Anyone’s. Not even for “Ringo Starr and His All Starr Band.” However, with a little help from one of my daughter Lauren’s closest friends, Ringo’s press agent Elizabeth Freund, I wavered. We were invited to another reception for the Starr at seven sharp!—one hour before his show. It occurred to me that, having met the only other surviving Beatle, Paul, not to meet Ringo was something like meeting Hansel, but dodging Gretel. In an austere, notably “unmusicated” VIP suite at the Music Hall, we were joined by a dozen or more invigorated hirsute, hunched and hobbled sixty-somethings we could more or less identify as oldies-but-goodies rockers, but didn’t recognize—and their uniformly svelte companions, whom I still strongly suspected were one and the same quick-change genie. Ringo entered and immediately began to mix. From no more than several feet away, you notice (and marvel at) how good he looks—trim, vigorous and buoyant, and happy—so genuinely, he makes you happy. And, like that!, he just about walked into me, we shook hands and chatted briefly. Believe me, you’ve had the same conversation, the passing exchange of pleasantries with someone, at any party you’ve been to. If I had any thoughts about slipping away from the show, Elizabeth dispelled them by telling us emphatically that whatever we did, we should not leave early. That was tantalizing. Lauren and I wondered privately if it might be possible Paul McCartney would materialize, the ultimate magic trick. I tired of rock concerts some time ago, fortunately while I still had my hearing. Tired of strobe lights in my eyes and obstructive bodies with arms and bottoms waving in opposite directions, largely in my face. But I was impressed by each “All Starr” taking his star turn. Then I got my first big treat, Ringo singing, “Yellow Submarine.” Not long after, Ringo singing, “Act Naturally.” And all at once, in half the time of a Yankee game!, it was the finale. And all those oldies-but-goodies guys were filing onto the stage and joining Ringo for, “With a Little Help From My Friends.” Pretty good! Then, Yoko Ono joined them. I like her as little as the most passionate Beatle fan likes her, and less than that on a visceral level. Nevertheless—impressive; she’s there. Moreover, she and Ringo are stage center, singing. Which must mean they’re talking. I’m a little disappointed. I had hoped to see Paul on that stage wishing Ringo a “happy…” not just any happy birthday, but a happy 70th. A Beatle turned 70 years old! Still, it’s quite a show, and it’s Yoko and it’s Ringo’s friends and I’m glad I stayed for it. And all around me, people are standing and singing and screaming and clapping their hands, and raising their arms and whatever rises with them and waving to outdo themselves. This is Ringo’s “Peace and Love” message coming to fruition for him and for them, at least as far, by far, as “Peace and Love” can carry on this July 7th. “Yes I get by with a little help from my friends/ With a little help from my FRIENDS!” Fortissimo! And everyone’s leaving the stage, waving goodbye to the audience. And Ringo’s saying things like, “You’re a great audience” and “I love you, New York” and “Thank you, New York” and he’s waving… goodbye! And he’s gone. And the house lights come up. And New Yorkers actually seem to have had enough. Time to take their heat to the hot streets. But my eyes are on two guys scrambling to the stage and frantically working to set up a very tall amp smack stage center. And I’m looking for the screens to drop down. This must be it—Paul McCartney via satellite from somewhere in the world where he’s performing. And that’s OK. Paul’s going to wish Ringo a happy birthday! And out comes Paul McCartney. And all I could think of were the two men who weren’t there and why they weren’t there, and try as I did to resist, my eyes filled and tears trickled. And the party was over. Two classy men, icons of our time no doubt, casually, unceremoniously left the stage. And when the lights came up again—no question it was over, where could it go from there?—all who were around me were awed and elated and not so much saying anything as grunting their inexpressible wonderment. I’m listening for two words I fail to hear: Gilad Shalit. Who? That’s my point. Since he’s probably not part of your table talk either, permit me to tell you about Gilad Shalit. On a Sunday morning in June of 2006, Gilad, a nineteen year old corporal in the Israel Defense Forces, was abducted from an army post on the Israeli side of Gaza’s southern border by a Hamas ambush. He is thought to have suffered a broken hand and a light shoulder wound in the attack. We’ve heard a lot about the “humanitarian” flotilla and the Gaza blockade over the past five weeks. But the real blockade is the barely-mentioned, complete sealing-off from the world of one young prisoner of war, Gilad Shalit, by Hamas. The International Red Cross has repeatedly requested, and been denied, access to him. The Papal Nuncio to Israel was unable to secure his release through the Catholic Church's Gaza-based parish. Egyptian mediators got nowhere with Hamas. The only contact Gilad has had with anyone outside his Hamas imprisoners is three letters (one to the Egyptian mediators), an audio tape released after one year of captivity, and—as a result of Israel’s fulfillment of its offer to release 20 female Palestinian detainees and prisoners in exchange for a video proving Shalit was still alive—a video shared with Israelis via television last October. This blockade, longer by a year than the Gaza Strip’s, is anything but humane. Shalit has been imprisoned by Hamas more than four years. As Israel Defense Minister Ehud Barak observed regarding the 1.5 million people in Gaza needing humanitarian aid, “Only one of them is locked in a tiny room and never sees the light of day, only one of them is not allowed visits and is in uncertain health”—the young captive Israeli soldier who isn’t getting it. The same is true of attention, basic human, humane, humanitarian attention. Google “Gilad Shalit” or otherwise search for him on the Internet—you’ll find shockingly little, especially for a young soldier whose sole transgression, in common with soldiers of every other country in the world, was serving his country. On people’s lips? Not only is “Gilad Shalit” not on their lips, but not on their minds or even remotely in their cognizance. Not for the first time, the Israelis are faced with a governmental “Sophie’s Choice.” The “choice” in this instance is the release of some 1,000 Palestinian prisoners held by Israel in exchange for one Israeli captive held by Hamas: Shalit. “That's the price I am willing to face to bring Shalit home,” said Israeli Prime Minister Benyamin Netanyahu six days ago. Israel sets great store in recovering every captive. Leviticus 19:16 reads, “You shall not stand idly by the blood of your brother.” In 1957, Israel returned some 5,000 POWs to Egypt for one Israeli pilot, Jonathan Etkes. In 1968, 4,338 Egyptian soldiers taken captive six months earlier by the Israel Defense Forces during the Six-Day War were exchanged for 11 Israeli soldiers captured by Egyptian forces. In 1985, Israel released 1,150 Palestinian prisoners in exchange for three Israeli soldiers abducted by the Popular Front for the Liberation of Palestine (PFLP). In 2008, the Israeli government voted to exchange an untold number of living Palestinian and Lebanese prisoners for the dead bodies of two soldiers who had been kidnapped by Hezbollah militants two years earlier. I don’t hear anything like “humanitarian aid” without also hearing “Gaza,” Palestinians,” “the flotilla.” I don’t hear “blockade” without “Israel” and “outrage.” “Gilad” would catch my attention anywhere; I might hear it across Madison Square Garden. “Shalit” would resonate. I think I’d catch it whispered at a dog’s pitch. Try me. My gratitude to Uri Dromi for many of the details in this entry.